Killing US citizens……Russia is worlds largest asbestos exporter. WASHINGTON – Asbestos imports to the U.S. soared by nearly 2,000 percent between July and August, according to federal import data analyzed by the Asbestos Disease Awareness Organization (ADAO) and Environmental Working Group. According to the U.S. International Trade Commission and the Department of Commerce, in August alone, the U.S. imported 272 metric tons of asbestos, compared to 13 metric tons in July. The striking increase is a major indicator that industry is not concerned about President Trump and the Environmental Protection Agency (EPA) taking any steps to ban or even reduce the use and import of asbestos. As the U.S. Geological Survey reported, the only remaining user of raw asbestos in the U.S. is the chlor-alkali industry, which uses it to make semipermeable asbestos diaphragms needed in the manufacturing of chlorine and sodium chloride. The EPA was given new powers to ban and restrict dangerous substances like asbestos when Congress passed legislation in 2016 overhauling the federal Toxic Substances Control Act, or TSCA. Asbestos is one of the first 10 substances the EPA is assessing for safety following the updates made to the revamped chemicals law. Although the EPA has not yet made a decision about the safety of asbestos under the new TSCA, recent actions by the Trump administration lay the groundwork for the agency to find that asbestos is safe and should remain legal. Last week, the White House released its Fall 2018 deregulatory agenda, further indicating that Trump’s EPA, under acting Administrator Andrew Wheeler, has no plans to implement a ban of asbestos. The last asbestos mine in the U.S. closed in 2002, forcing the chlor-alkali industry and other users to rely on imports. In 2017, all of the asbestos imported into and used in the U.S. came from Brazil. Between January and August of this year, the industry spent nearly $1 million to import 555 metric tons of asbestos from Brazil and Russia. Last year, the U.S. imported more than 341 metric tons of asbestos, and 2018 imports are expected to double. Lobbyists from the American Chemistry Council, working on behalf of the chlor-alkali industry, are now pushing the Trump administration for an exemption from the new chemical safety law that would allow it to continue to import and use asbestos just as it does today. Analysis of federal data from the Centers for Disease Control and Prevention suggests that asbestos-triggered diseases kill an estimated 15,000 Americans a year. A recent study led by Jukka Takala, president of the International Commission on Occupational Health, found that the death toll from asbestos exposure may be much higher, at nearly 40,000 Americans a year and more than 255,000 a year worldwide. “It is clear that under the Trump administration, U.S. asbestos imports and use are not decreasing. The science is irrefutable, there is no safe level of asbestos exposure or controlled use. Clearly, the chlor-alkali industry is lobbying for another exemption.” said Linda Reinstein, president and co-founder of the Asbestos Disease Awareness Organization. According to the U.S. Geological Survey, in 2016, roughly 95 percent of the asbestos imported into the U.S. came from Brazil, with the rest coming from Russia. But in November 2017, Brazil joined more than 60 other nations and banned asbestos. Brazil’s ban, which will be in full effect soon, leaves Russia, Kazakhstan and China as the world’s dominant asbestos producers. 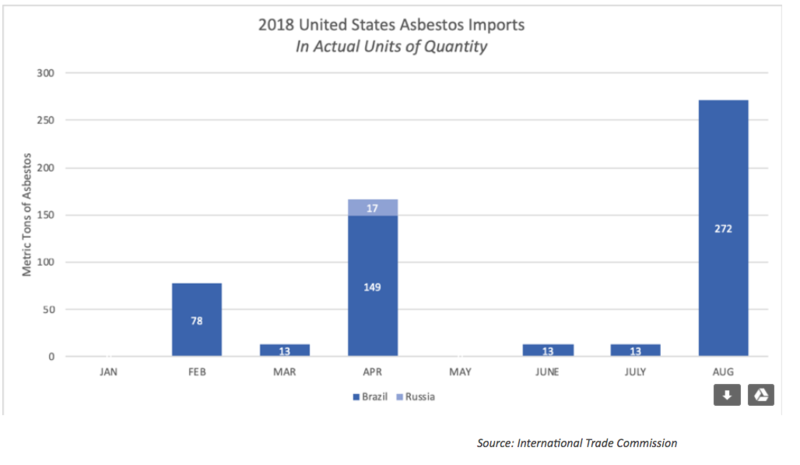 With Brazil poised to no longer provide the vast majority of asbestos to the U.S., Russia and Kazakhstan could fill the void. Because of people like you, another world is possible. There are many battles to be won, but we will battle them together—all of us. Common Dreams is not your normal news site. We don’t survive on clicks. We don’t want advertising dollars. We want the world to be a better place. But we can’t do it alone. It doesn’t work that way. We need you. If you can help today—because every gift of every size matters—please do. Without Your Support We Simply Won’t Exist.